DreamSaver founder and President Chris Shiver, third from left, shows off a sample of the heat-resistant material. 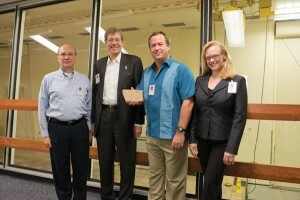 With him are, from left, DreamSaver advisor and interim CEO Jeff Cartwright, Houston Technology Center President and CEO Walter Ulrich, and Kathleen McNeil, Shiver’s executive assistant. The fear was palpable; the kind that makes it hard to sleep at night. With his Austin home badly damaged by flood waters, Chris Shiver was engulfed by waves of anxiety as his mind raced with the thought that a life’s worth of photos lay ruined under several inches of muddy, murky water. Shiver could finally exhale when he returned to his home after a couple of days to find his cherished photos still dry and intact. That close call over 20 years ago planted the seed that grew into the founding of DreamSaver, a company that is poised to alter the landscape of the fire, heat and water protection industry. DreamSaver box (in frame) before burn test and box after burn test. Shiver, a serial entrepreneur who started raising money for startup companies while in college, allowed the idea of devising a better way to save people’s valuables to germinate for a few years while he pursued other business interests. The son of an entrepreneur, Shiver graduated from Texas Christian University with a degree in Economics and a double minor in marketing and communications. He co-founded Boulder, Colo. based Pelion Systems in 1996, which developed manufacturing software and helped clients solve a myriad of manufacturing issues. The company was a profitable entity before Shiver resigned his position as Director and VP of Business Development in 2001 to make an attempt at climbing Mount Everest, prior to the company being sold in 2004. Shiver then embarked upon a career working for high end island resort properties in exotic locations such as Fiji, Belize and the Philippines. “I wanted to get paid to go scuba diving, so I ran six different resorts in three countries, including an attempt to build Poseidon Undersea Resort in Fiji,the world’s first seafloor resort,” says Shiver, a lifelong bachelor with no children. Contents of box unharmed after burn test. But the idea of developing a fire, heat and water proof container that would be better than the costly and minimally effective products currently available was still just a dream. 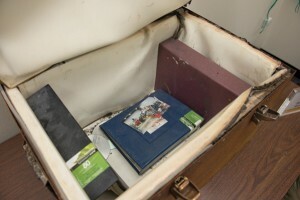 Through extensive research, he learned that current fire proof safes are merely “flame proof” and do not prevent the build up of internal heat that can melt photos and other valuables stored inside. But Shiver didn’t have an answer for the central question: “What kind of material should a truly effective flame and heat proof safe be made of?” To find that answer, the New York born Shiver, who thanks to the global reach of his father’s career, lived in several domestic and international locations as a kid, looked back to his childhood. “I had family here (Texas) and like most kids in the 1960s and ‘70s, I was an Apollo and, later, Space Shuttle junky. To me, one of the greatest aspects of all those missions was being able to bring those spaceships back from space through the heat generated upon re-entry. I was fascinated by the kind of material that could do that, yet the people inside weren’t burnt to a crisp,” Shiver says. Chris Shiver with box before burn test. In 2006, he learned of the Space Alliance Technology Outreach Program (SATOP) at the Johnson Space Center (JSC). The program helps people like Shiver with a kernel of an idea navigate through the labyrinth of regulations necessary when trying to work with NASA. Through SATOP, he met Dr. Paul Ledoux, a heat transfer prevention specialist who’s worked with NASA since the Apollo program. 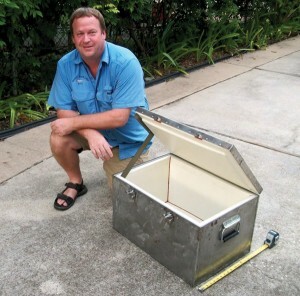 Ledoux, now on DreamSaver’s advisory board, told Shiver developing the material to construct the heat proof safe is feasible; it’s simply a matter of making it cost effective. By 2010, Shiver had moved back to the U.S. and was ready to go all in on the idea. 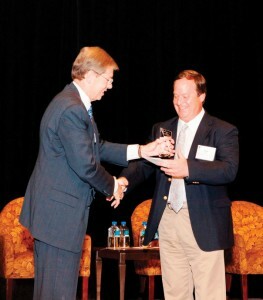 Houston Technology President and CEO, Walter Ulrich presents Chris Shiver with the award from the 2012 Goradia Innovation Prize Program. Fortunately, the Houston Technology Center (HTC) had recently entered into a partnership with JSC that was designed to further expand HTC’s mission of accelerating the growth of emerging technology companies in the Houston area, and to develop the foundation required to support NASA’s long-term goals of increasing private/public collaboration. Shiver, who founded DreamSaver Enterprises, LLC in March 2011, was first in line to sign up for the HTC’s “Incubator” program at JSC. The company received a huge shot in the arm when it won third place—and $15,000—in the 2012 Goradia Innovation Prize program, presented by the HTC and the Greater Houston Partnership, with founding support by Vijay and Dr. Marie Goradia. The award recognizes early stage Gulf Coast region companies seeking to bring innovations to the marketplace. “I needed help breaking through the firewall at NASA and finding the people and resources that would help us develop our product. The HTC program allowed us to begin that process,” he said. 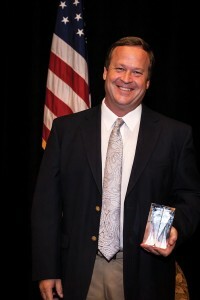 DreamSaver’s Chris Shiver with Goradia Innovation Prize Program award. At about the same time, Shiver met retired astronaut Dr. Scott Parazynski, now DreamSaver’s chairman and CEO, and a veteran of five Space Shuttle missions and seven spacewalks. More importantly, Parazynski was the lead astronaut for Space Shuttle thermal protection system inspection and repair following the 2003 Columbia tragedy. Shiver and Parazynski developed a plan to construct what would become DreamSaver’s initial product offering: a box that can store valuables that would prevent them from being damaged due to extreme heat or flooding, but in order to take the plan from the drawing board to reality, the team needed a “mad scientist” to find the right mixture of composites. Enter Clark Thompson. 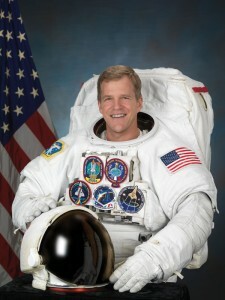 Chris Shiver’s DreamSaver partner and former NASA astronaut Dr. Scott Parazynski. The enigmatic Thompson, DreamSaver’s chief technology officer, worked with Parazynski’s team on the development of the shuttle heat transfer project and is regarded as a brilliant engineer. He was even recognized by NASA with the 40th Anniversary Space Flight Award for Leadership for his efforts in helping the Space Shuttle return to flight post-Columbia. The group began gathering at Thompson’s rural property near Alvin to blend and test various composite concoctions to find the ideal mix of heat transfer properties and affordability. After several tests, the team settled on the current mixture, which withstood exposure up to 3,400 degrees for 30 minutes and was cool to the touch after 30 seconds. The team then purchased a nesting box at Hobby Lobby, made sheets of the newly formed material and secured it inside the box. After placing it in a bonfire, it came through with flying colors. A company was contracted to make a one foot by one foot by one foot welded, precision cut box that performed even better in testing. The current prototype is about the size of a foot locker. “We’ve taken the box up to 1,700 degrees for 30 minutes and the temperature stayed below 175 degrees inside. That’s impressive because the walls are just an inch thick and the box weighs about 88 pounds. 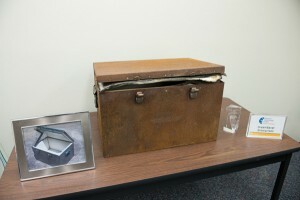 A comparable fire proof safe doesn’t exist, but if it did, it would weigh about 300 to 400 pounds and might cost $2,000,” Shiver says. 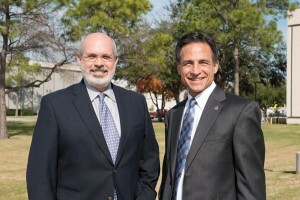 NASA Executive on Loan to JSC Houston Technology Center, Pat Kidwell, left and Tim Budzik, JSC Campus Managing Director for Houston Technology Center, right. In addition to the box, Shiver says DreamSaver, which recently added Jeff Cartwright, former President and COO of Igloo Corp. as an advisor, interim CEO and investor, seeks to secure partnerships with companies in a variety of industries that rely upon fire prevention and heat transfer technology, such as the oil and gas industry. He’s had preliminary discussions with officials at Shell Oil Company, and he can also see the material being used in roofing shingles or in a new type of sheet rock for home construction. “I look at where there’s a problem in the market and try to find a solution,” he says. Shiver says he’s grateful for the support DreamSaver, whose offices are in the HTC-JSC Accelerator building #35 at JSC, has received to get this far in the rough and tumble startup business world.